Just imagine the AC DC tune ‘Back in Black’ blaring out at you in your ultra high tech basement / workshop. You are the billionaire philanthropist and genius named Tony Stark. Inventor of the Iron Man suit and pretty much everything else in the modern age. 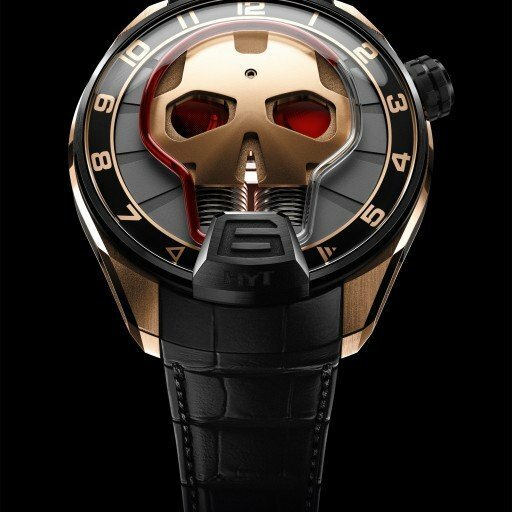 Hot rod red and gold is a great colour scheme for the suit, what about for the watch you are inevitably going to wear whilst not wearing the futuristic armoured suit? For those who are familiar with the work of HYT they will know that the innovative timepieces do not tell the time with just conventional hands, but also the use of a capillary within which are two liquids which are pushed back and forth to display the hours, one of which is coloured and the other is clear. As you can appreciate with a standard circular tube it is easy to work out volume and also the pressure at which the designated amount of fluid will move to mark the time accurately. This all goes out of the window when the shape of the capillary is changed from a simple circle to a skull. Another new development with this watch the called the Green Eye or the Red Eye is that the two eyes, or orbit apertures display both a power reserve in the right eye and a seconds dial in the left. 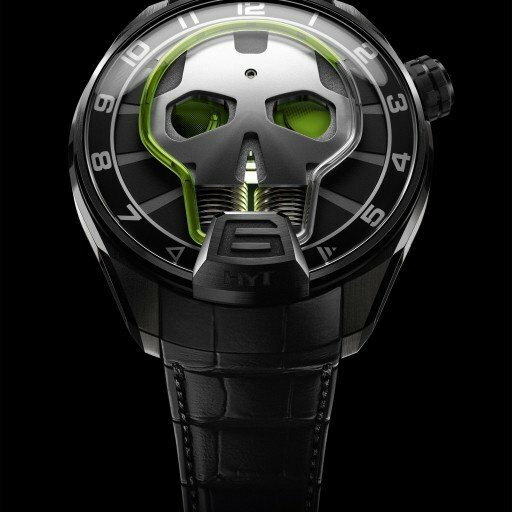 If you look closely on the dial, there are grooves that radiate out from the centre which link the hour markers to the skull shaped capillary. Reading the hour with the help of these lines is a real help! This makes for a very striking piece, both are on DLC titanium cases with different accents. I think these are really cool and certainly push the boundary more towards a piece of art on the wrist than a true timepiece. Cool and definitely a winner for the geek value that I hold so dear in terms of engineering and looks! The Red Eye is my choice of the two not just because it is limited to a run of 25 but also because it reminds me of the Iron Man films. Who doesn’t want to be Tony Stark?